← Let’s write this proposal! Total signature count: 88! Thanks so much to everyone who signed! SAA says we don’t need any more signatures. 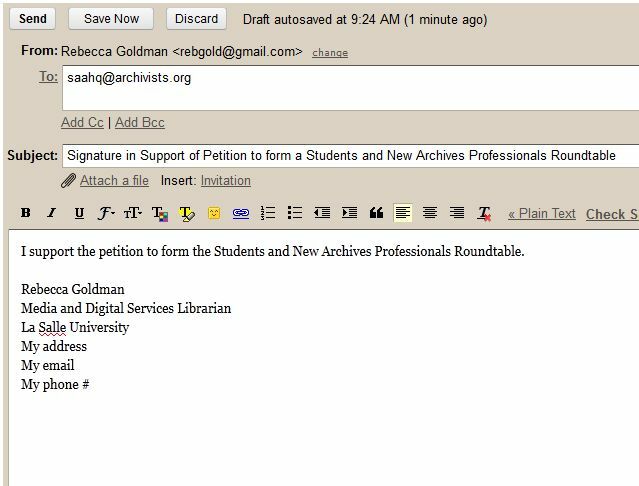 In the subject, put: Signature in Support of Petition to form the Students and New Archives Professionals Roundtable. Include your contact information in a signature block at the bottom of the email. You DO have to be a current SAA member (student members count!) to sign the petition. You DO NOT have to be a prospective member of the new roundtable to sign the petition. If you support us, please sign! Please spread the word–we need 50 signatures! I’ll update this post over the next few days with our total signature count. 7 Responses to Sign the Students and New Archives Professionals Roundtable petition! Signed and sent. Also posted to my library school’s virtual student forum! Thank you all for your hours of hard (and largely thankless) work in putting this together. It is certainly appreciated by this scared-of-the-coming-job-hunt December ’11 MLIS graduate and current special collections paraprofessional! Signed and I forwarded the blog link to the University of Texas SAA Student chapter and 2 professors. Fingers crossed! Done and done! I second the thanks for all your hard work in this process! This is the easiest thing I have to do all month. Thanks for all of your effort with this. This is a great idea! Thank you so much for taking the initiative to get this going. Just catching up on all my archivist news. Signed sealed and delivered!